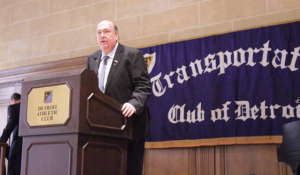 At their Annual Meeting, the Transportation Club of Detroit (TCD) elected new board members, including appointing David Pierce as the club president. The TCD Annual Meeting was held at the Detroit Athletic Club on Jan. 30, 2014. The installation of officers was performed by Wayne County Circuit Court Judge Lawrence Talon. Pierce is the executive director of global development at Evans Distribution Systems and is a recognized leader in the transportation and logistics industries. He is also the executive chairman for the Ergin Osman Memorial Scholarship Fund which provides financial support for disabled U.S. military veterans whose injuries were suffered during hostile action. Pierce’s efforts, along with efforts of retired Col. Hugh McLeod and retired Army Col. John Macik and many others, have helped draw awareness to the fund and its cause. 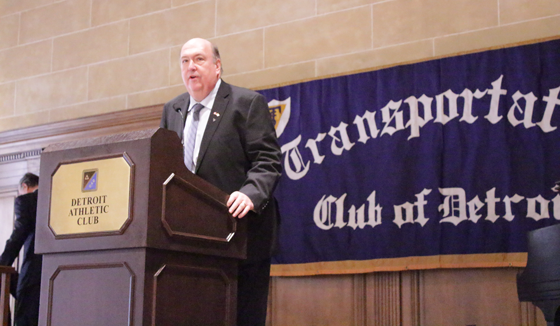 During his acceptance speech, Pierce said “we need to grow the TCD membership to more than 400 members”. The current membership is around 200, which Pierce says is a personal goal of his to improve. “We’re pleased to have such an enthusiastic and likeable person as our president, he will help us achieve new goals …he has already helped us achieve so much” said Kevin Dowd, the club’s secretary and treasurer. In 2013, the club provided $20,000 in scholarships to college students interested in transportation careers. At Evans Distribution Systems, Pierce develops relationships with customers to provide transportation solutions for automotive, manufacturing, food and beverage, consumer packaged goods and other industries. “Dave is a key player at Evans and is excellent at developing existing customer relationships as well as creating new ones” said Tony Trocki, general manager of transportation at Evans Distribution Systems. The TCD is an organization which promotes and encourages the highest standards of education and technical competence among the members of the transportation industry. The club was founded in 1984 and was formerly known as the Traffic Club of Detroit. To find out more information about TCD, visit www.transportationclubofdetroit.com.